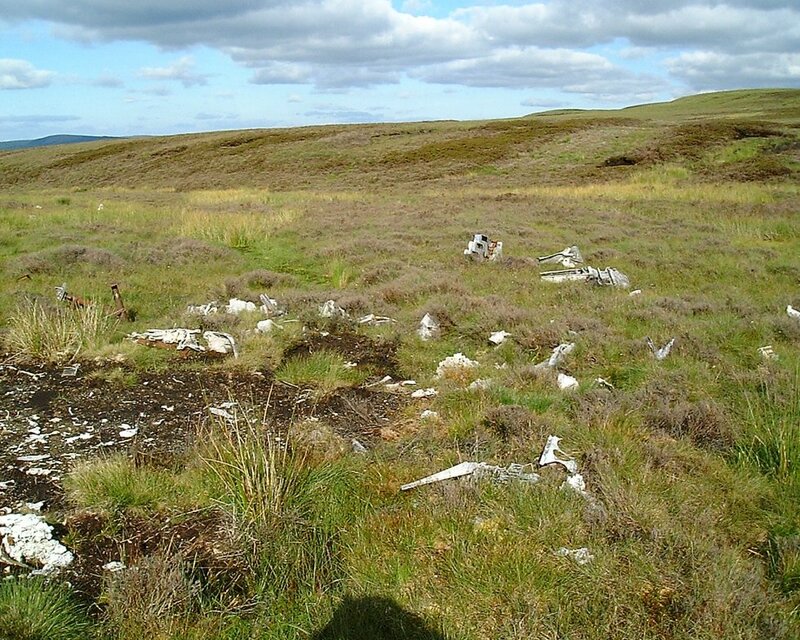 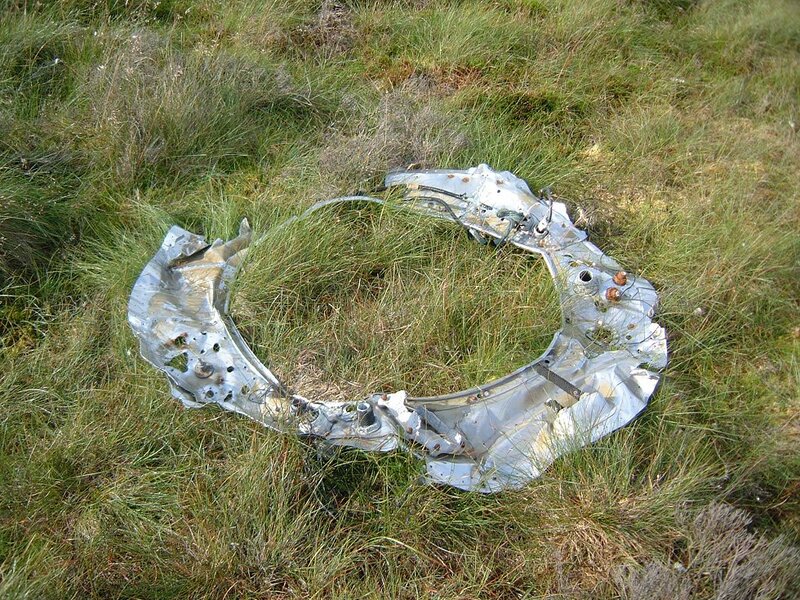 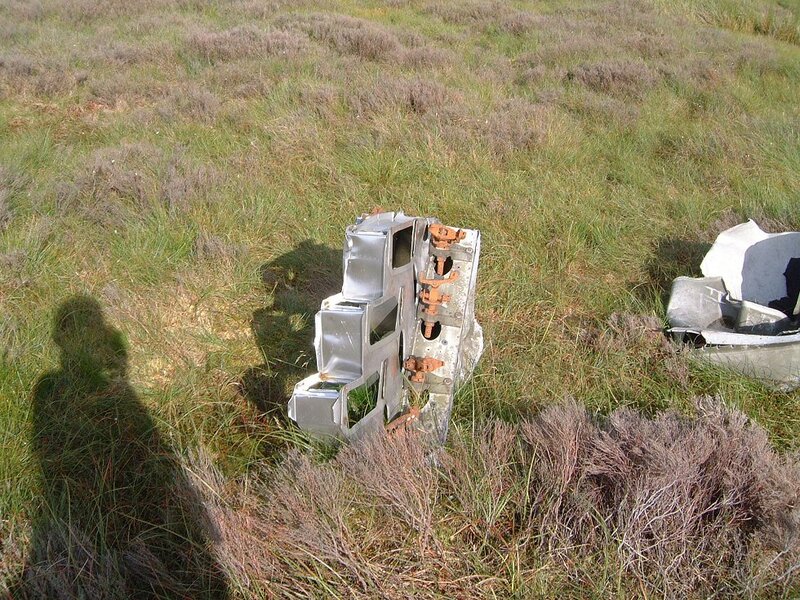 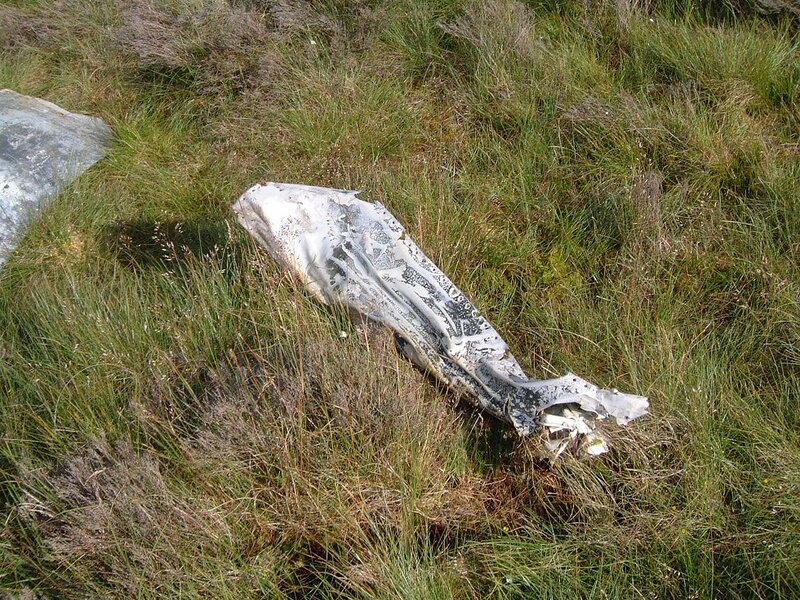 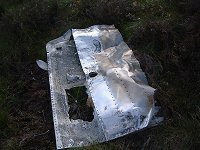 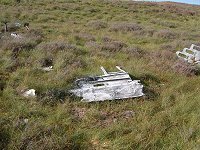 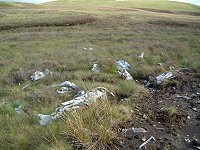 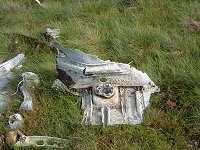 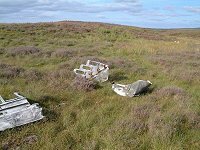 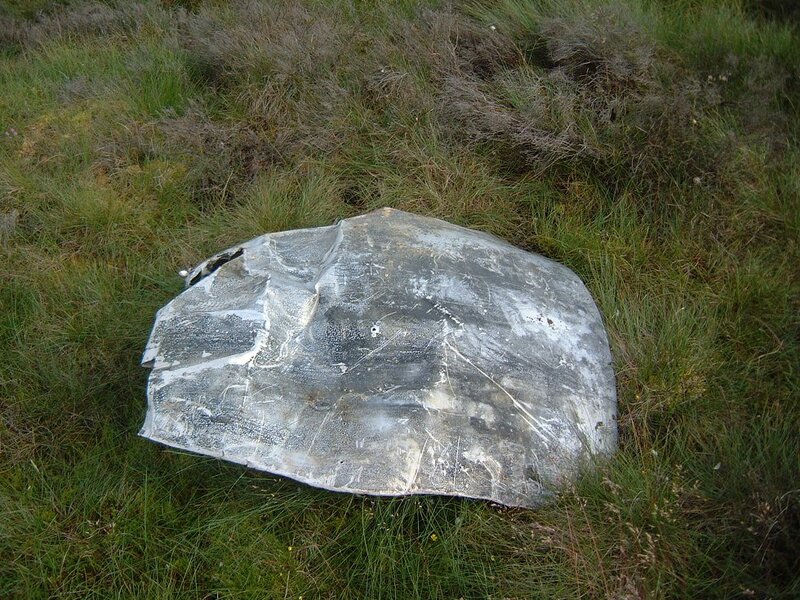 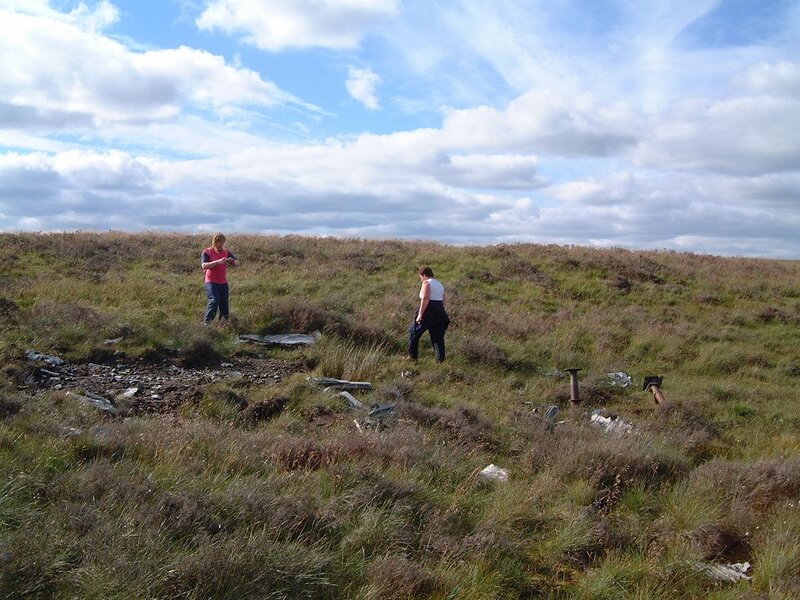 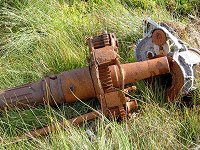 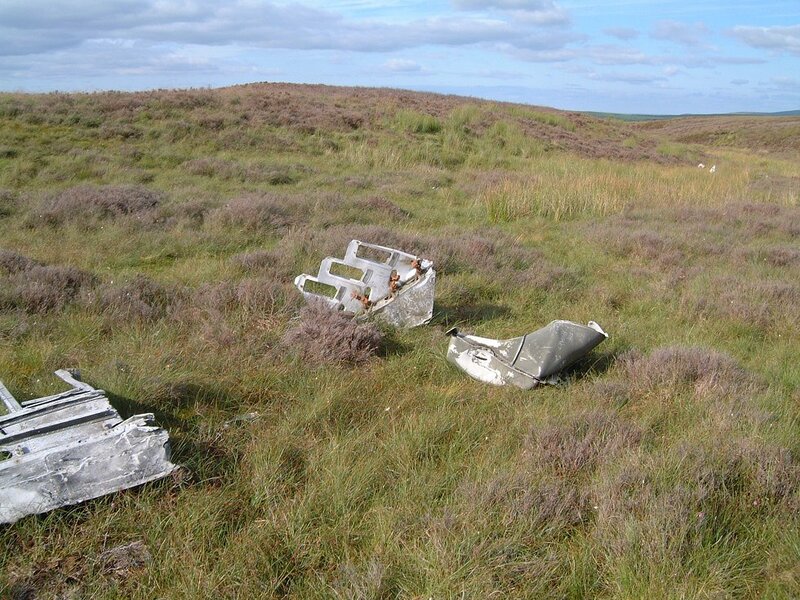 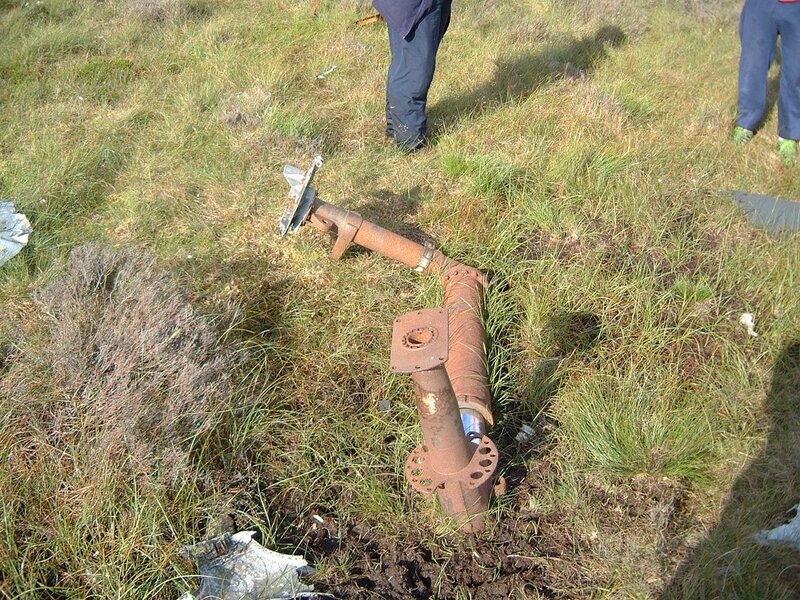 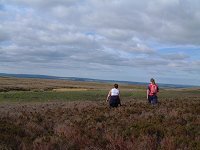 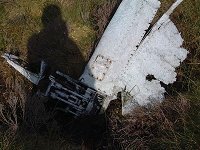 SORN AIR CRASH - 1956: The air crash on the bleak and wild moorlands on the other side of Blacksidend in 1956 has gone into local folk lore long ago. 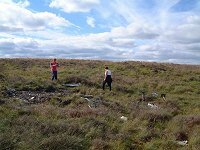 Most people I suspect in the village and surrounding area will not even have made the long trek to try and find the site. 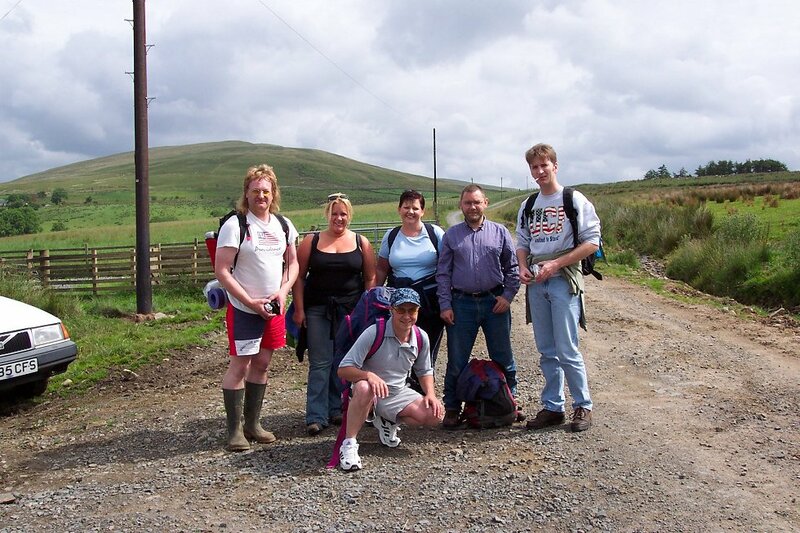 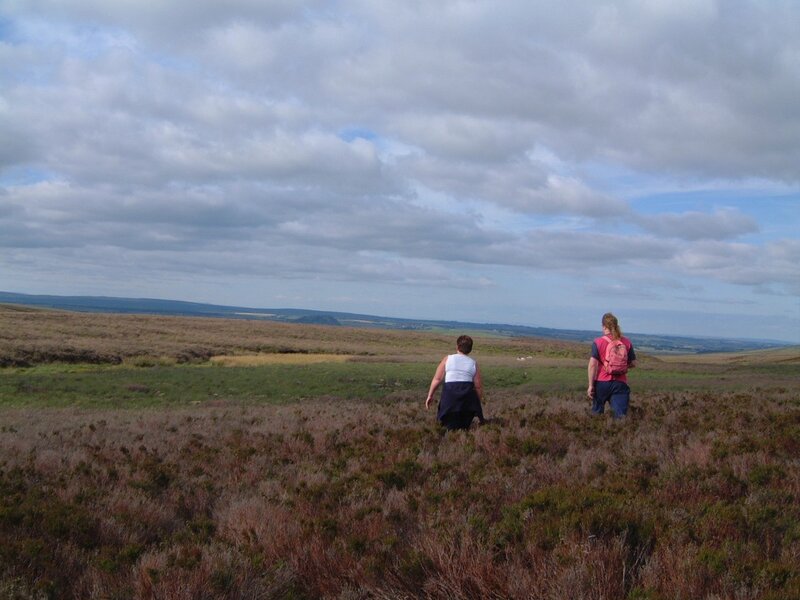 Hill walking is not everyones idea of a great day out. 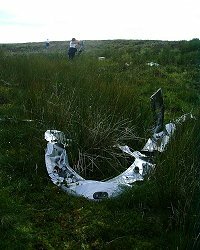 Many have made an effort though, and every now and again in my travels, I meet someone else who has made the long trip to the crash site. 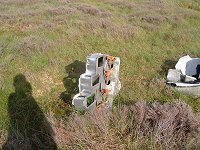 They are always full of the same enthusiasm and intrigue, just like I was after my first visit, by three of us on a quad bike. We spent more time pulling it out of ditches etc due to the rough terrain. 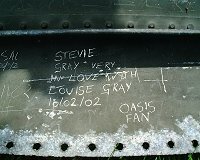 The site is not vehicle friendly. 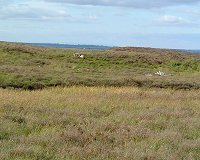 The location is quite easy to find once you know how, but I suppose that is like finding your way back to any former unknown area. 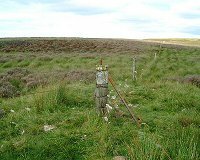 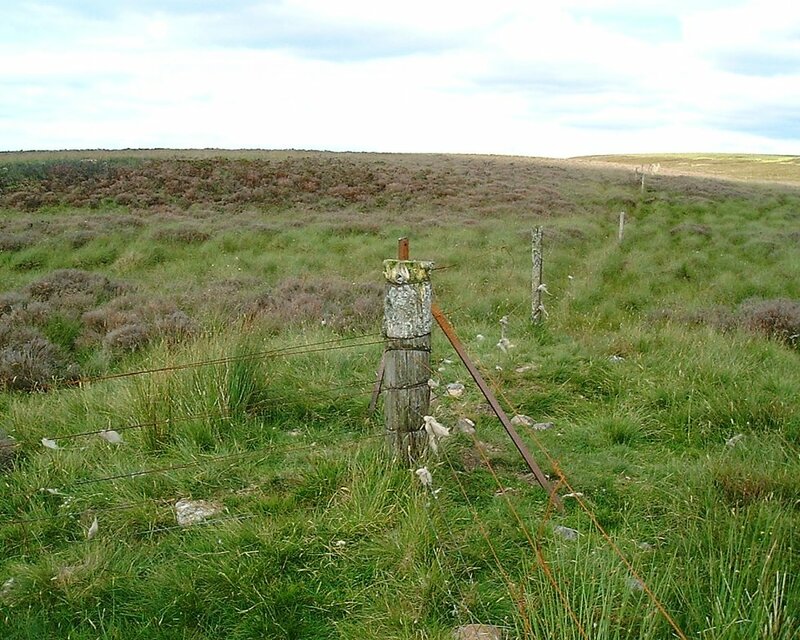 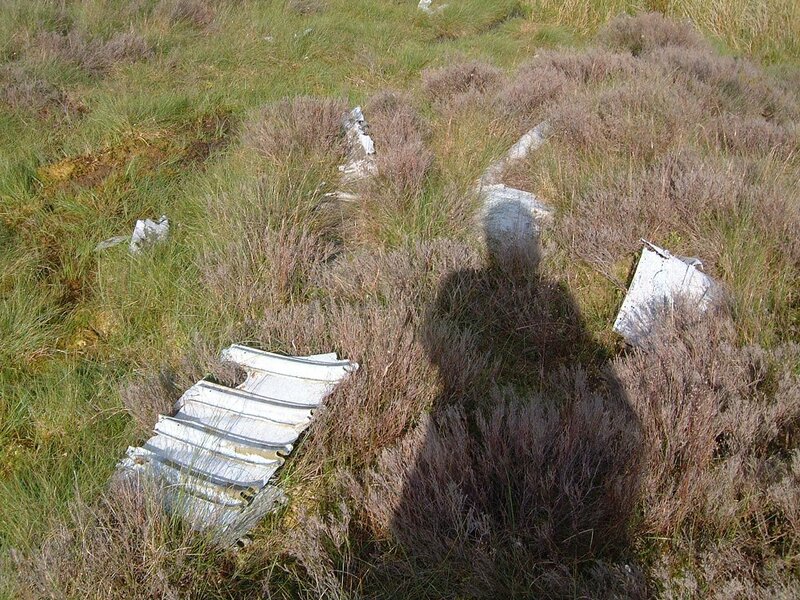 The first photo below shows the fence which splits from a single "march" dyke, or boundary line, into three. 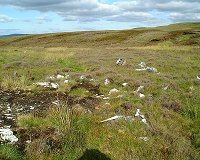 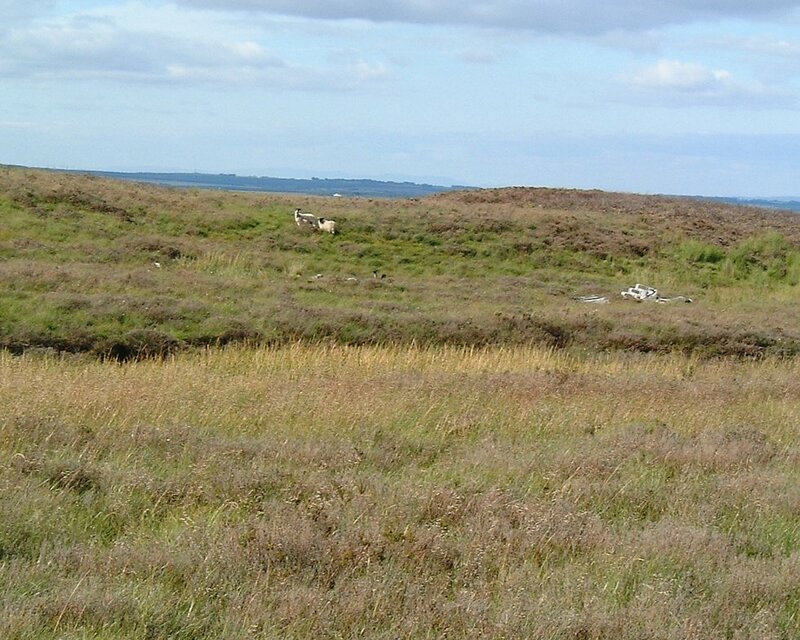 It is at this point that one should jump the fence and walk into the North East part of the land, for no more than about 100 or 200 yards or thereabouts, and you will find you are upon the wreckage. 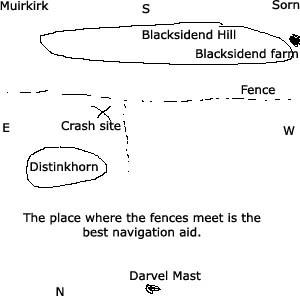 A simple rough map is given below. 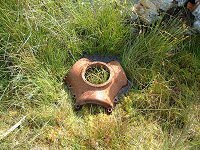 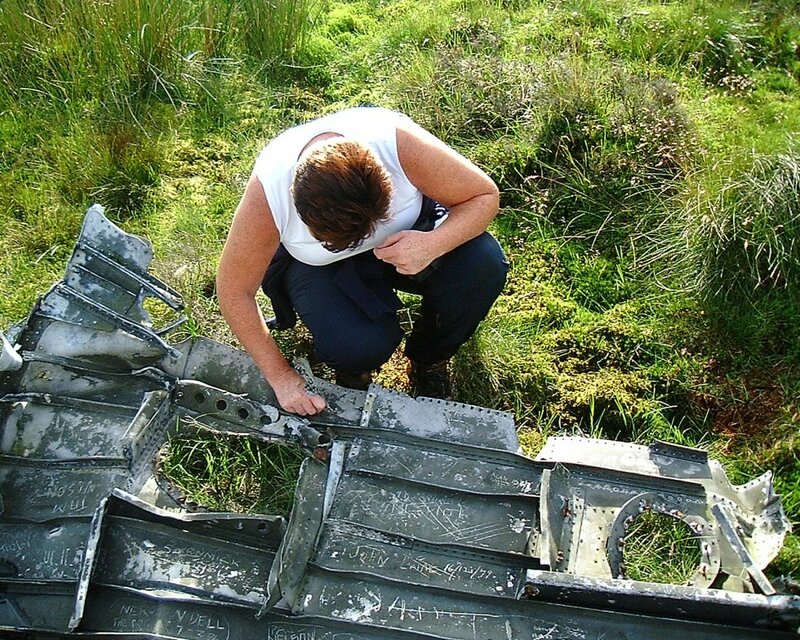 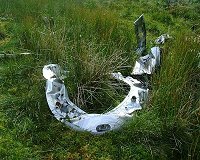 The most surprising thing when the casual hillwalker arrives at the site is how new and gleaming some of the metal work still is after fifty years. 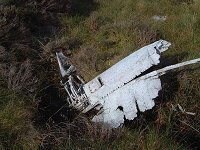 The wreckage lies on the ground as though it had fallen from the heavens in the last five years, and not the last fifty. 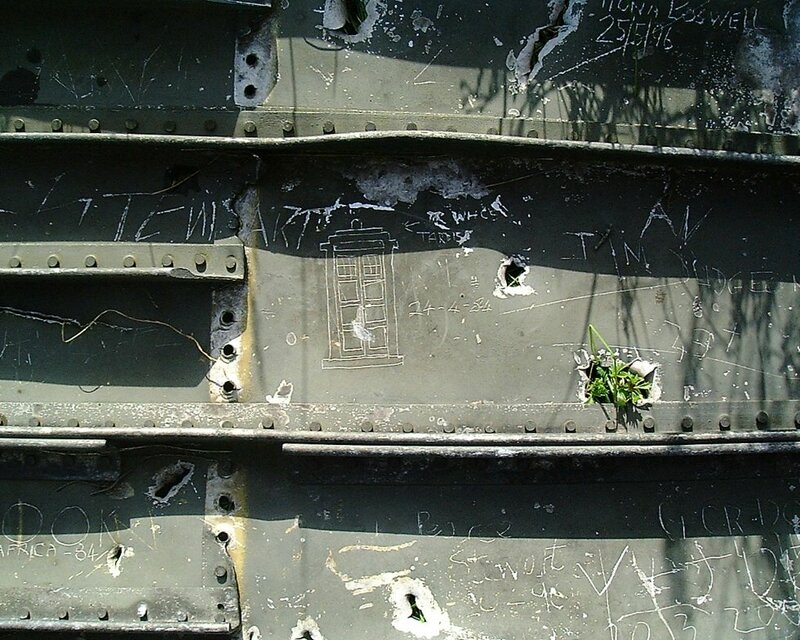 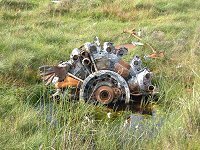 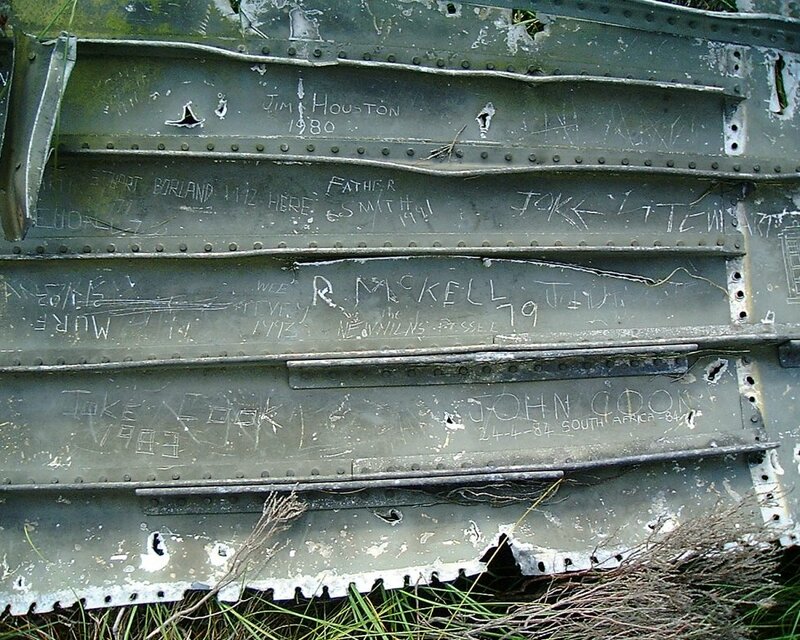 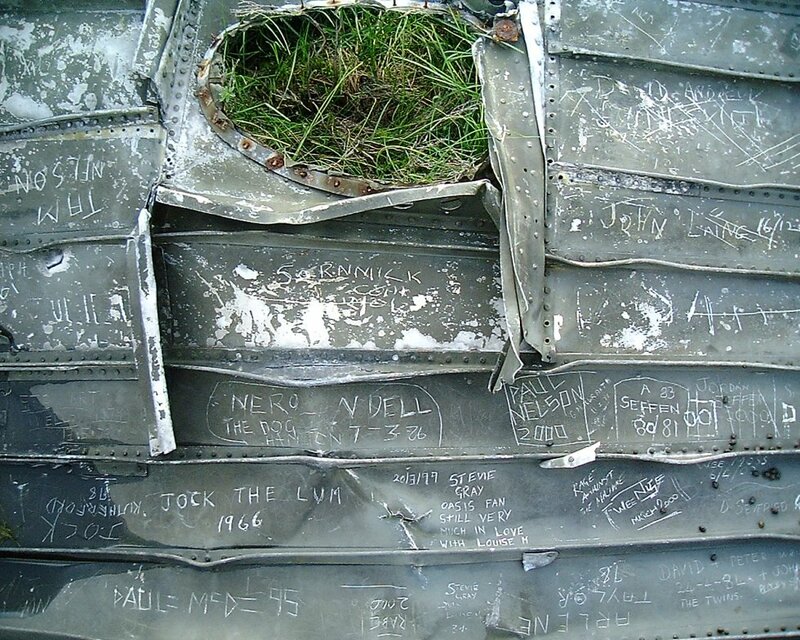 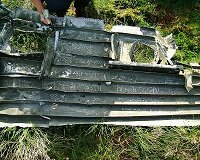 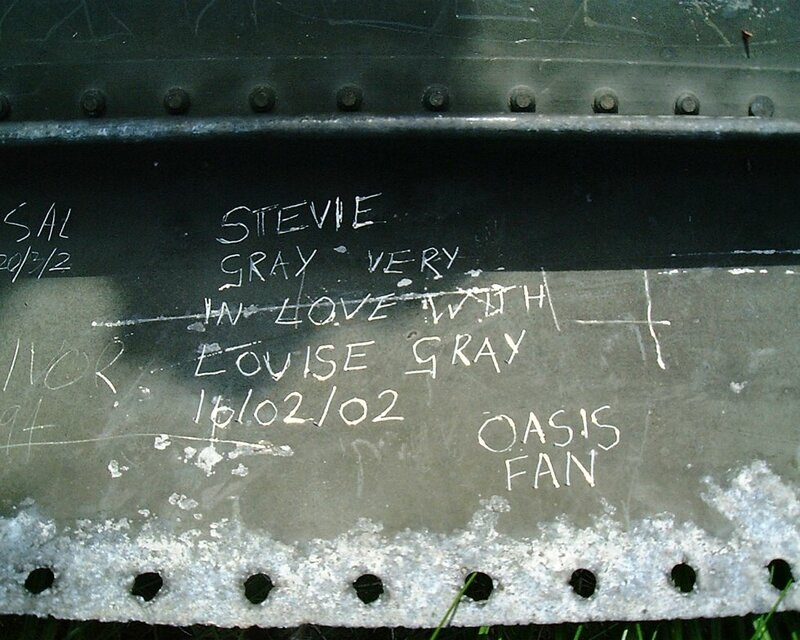 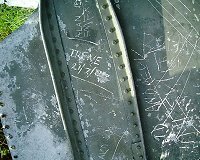 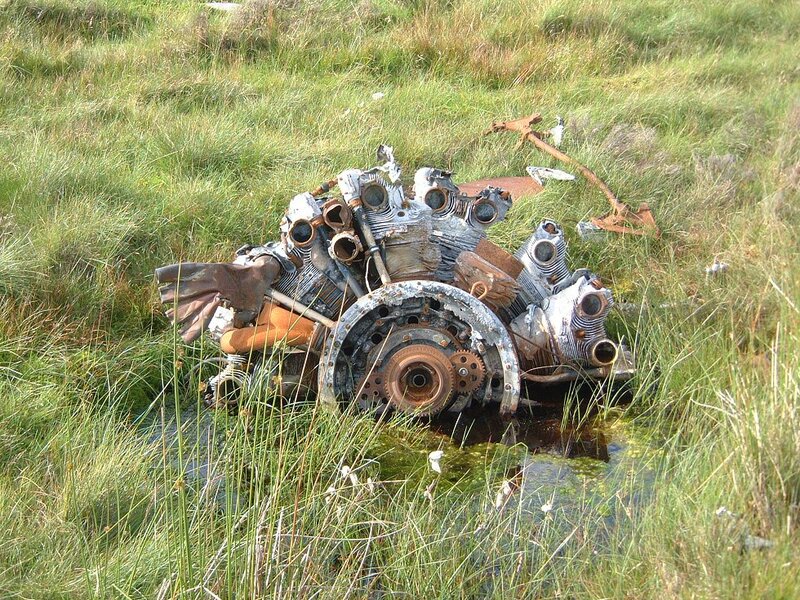 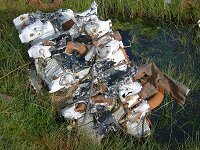 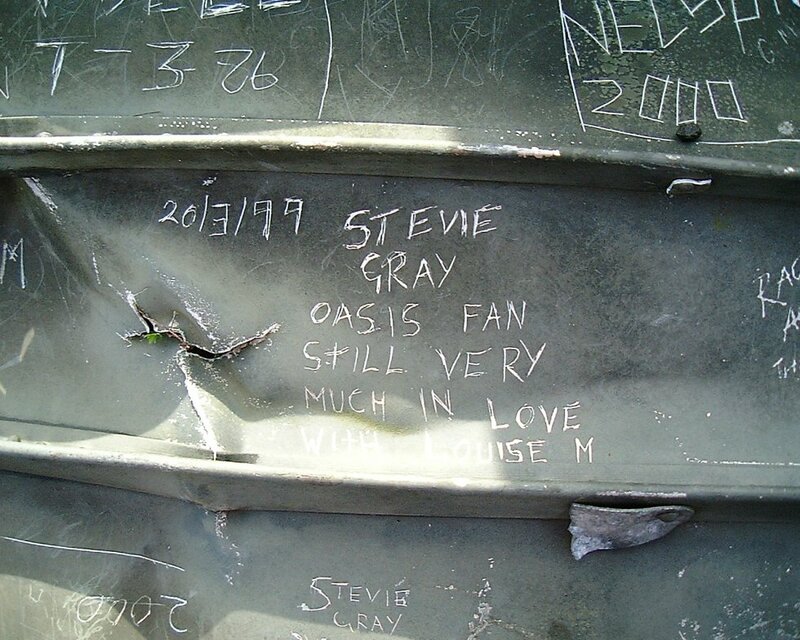 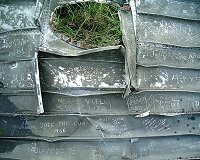 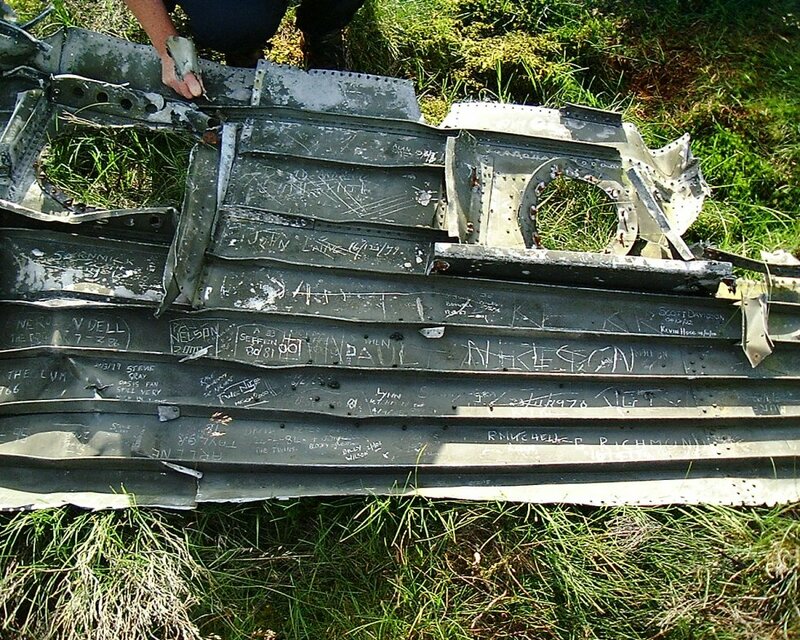 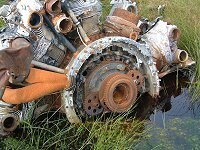 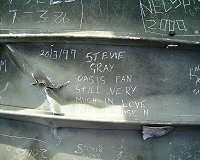 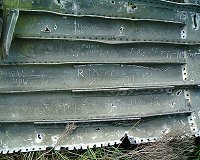 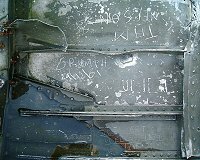 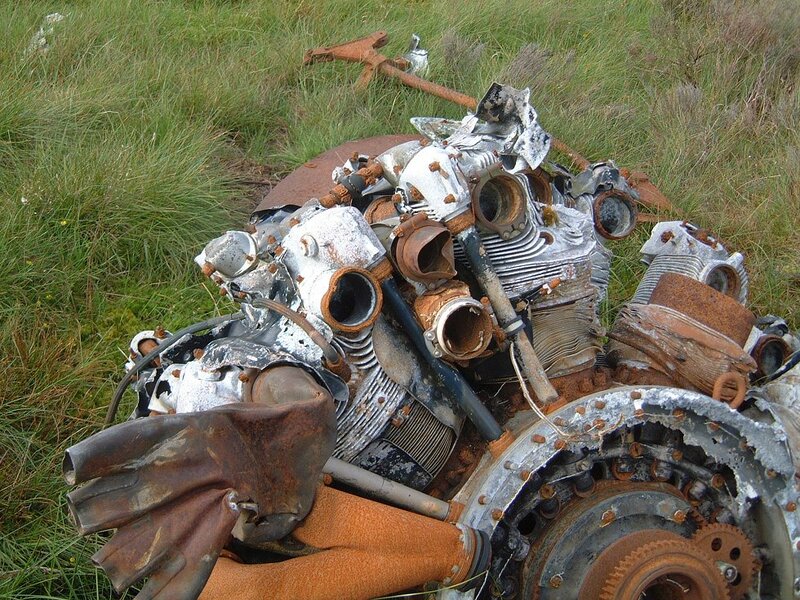 An engine lies in a puddle of water on the boggy ground, and other painted metal has been used as a kind of a guest book. 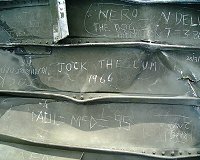 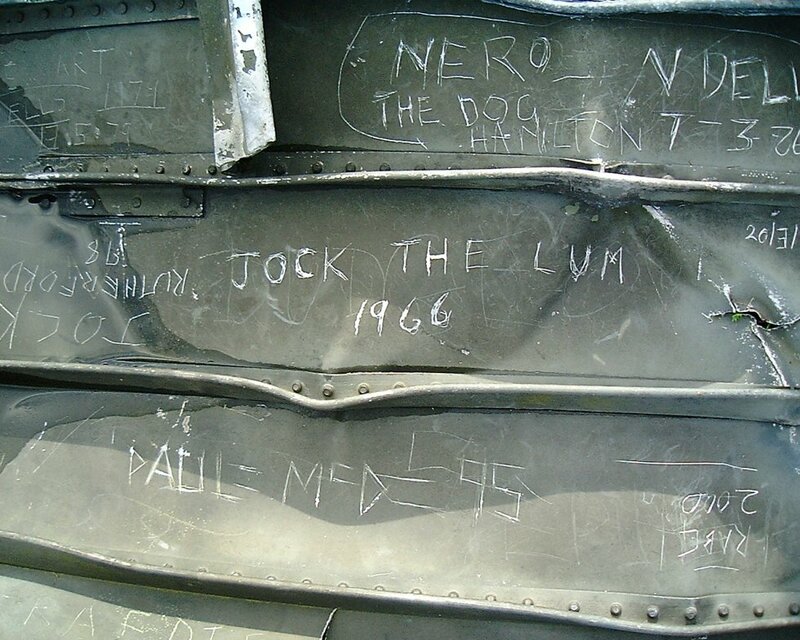 The earliest entry scratched on it's surface I noticed was JOKE THE LUM - 1966. 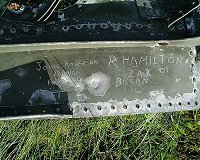 I have often thought about and wondered who JOKE THE LUM, or many of the others who made the pilgrimage out to the crash site really are/ were. 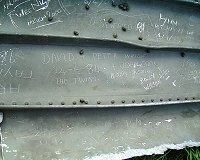 Equally mysterious were the two victims of the crash, in all but name. 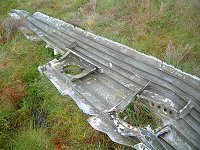 At various times in the past, since back in 2001 when I scanned the black and white photos from the 1950's, I wondered if anyone connected to the victims would ever stumble across ayrshirehistory.com. 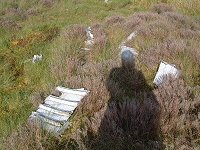 I suspect the troubled years when server after server seemed to either kick us off, disappear overnight etc did no favours to the search engines capabilities of keeping up with URL changes. 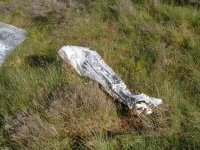 Oddly since July 2009 when the ayrshirehistory.com address was once again reinstated, GOOGLE has found us again quite quickly. 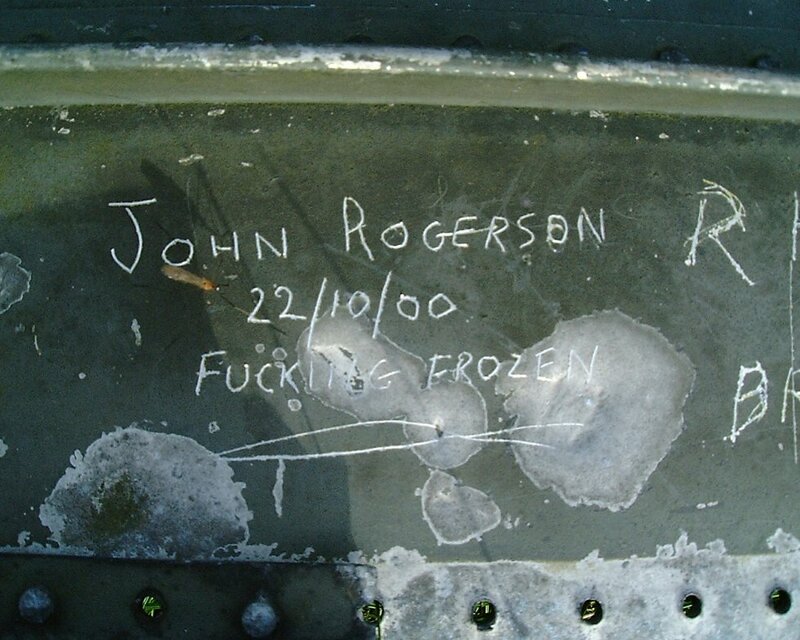 It finally happened. 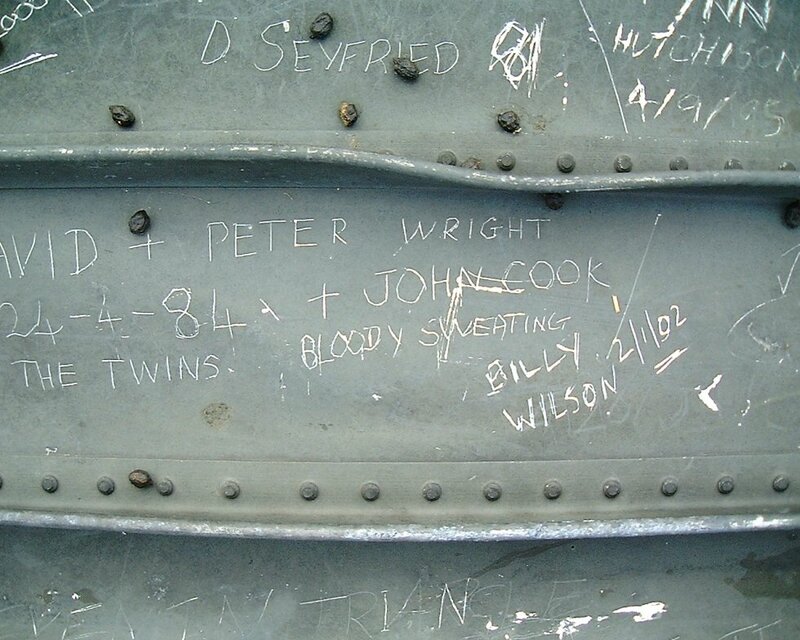 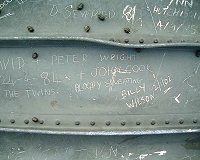 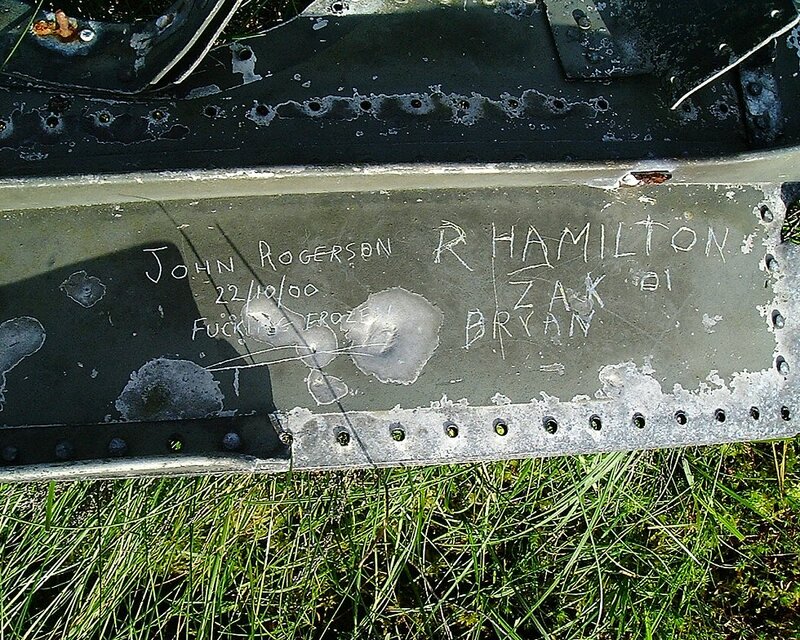 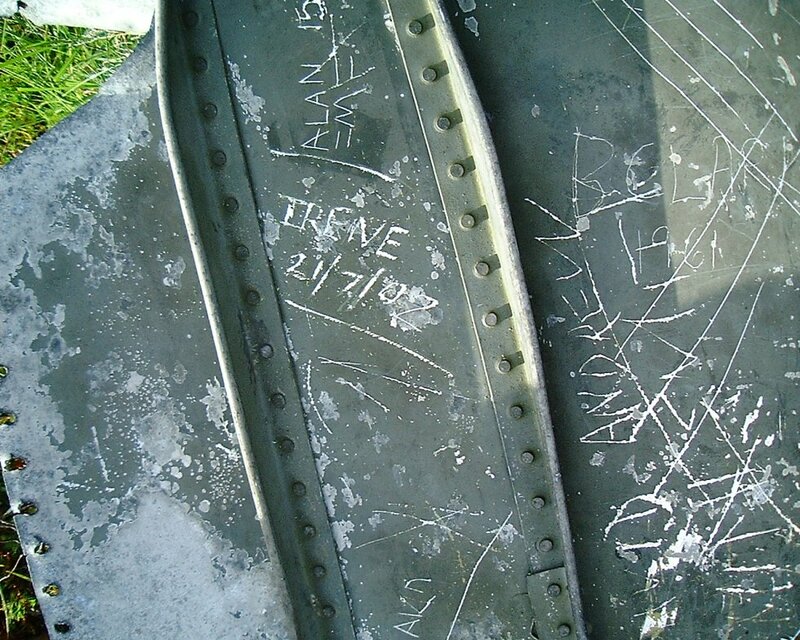 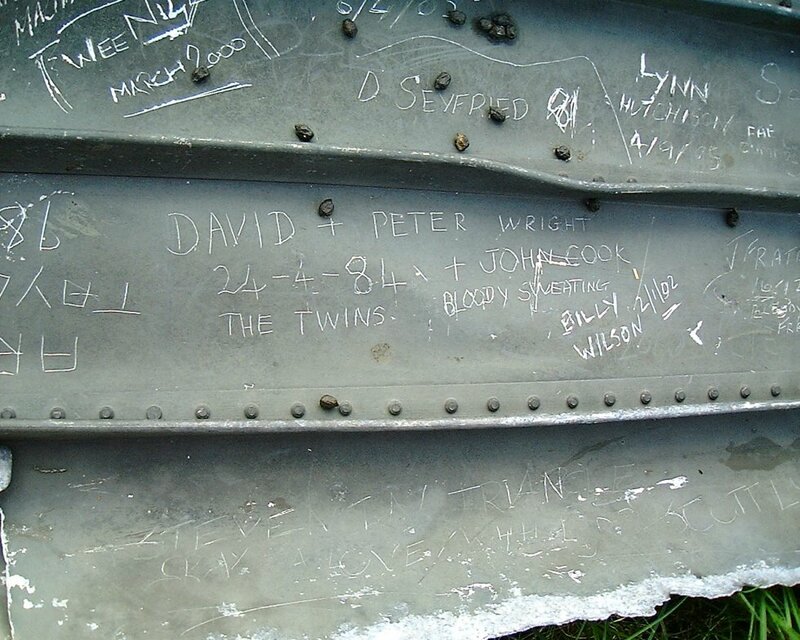 A surprising entry appeared on the guestbook over the weekend of 8th August 2009, from Rita Taylor Wadlington, the daughter of one of the pilots, Wayne Archer Taylor. 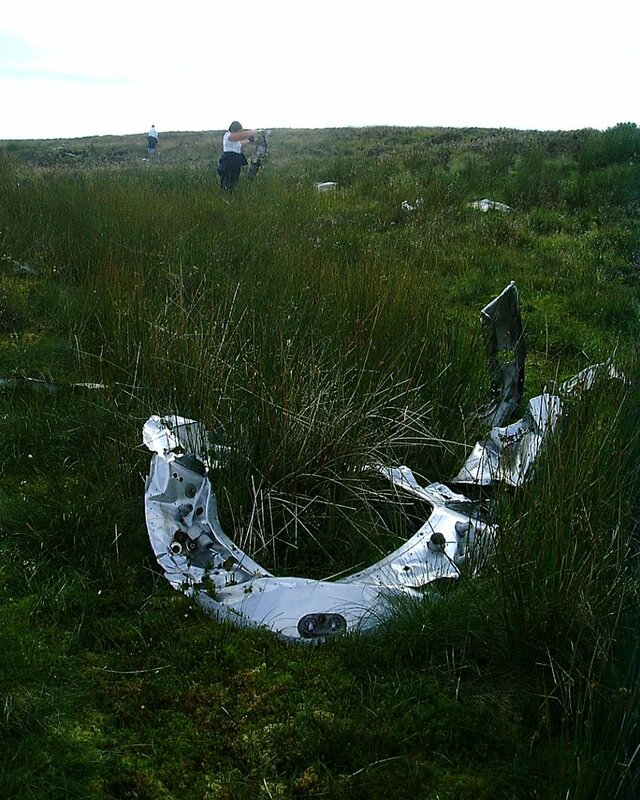 She had seen the web site last year just before it disappeared, and before her brother had the chance to see it. By a few chances of luck and the help of Alex Shaw JR, Scott Taylor is also now in touch with us here as well. 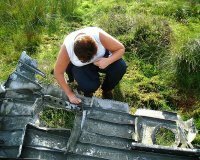 We hope to be able to bring some extra background details from the family of Wayne A Taylor soon. 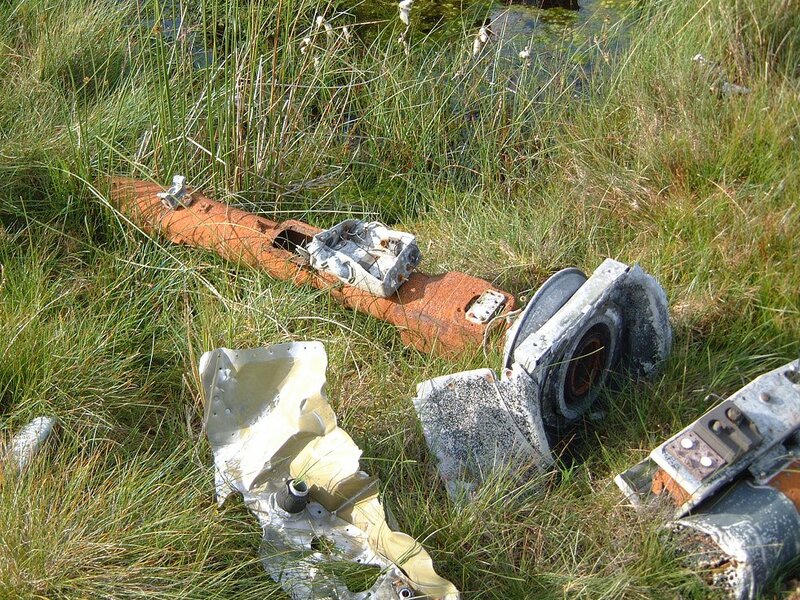 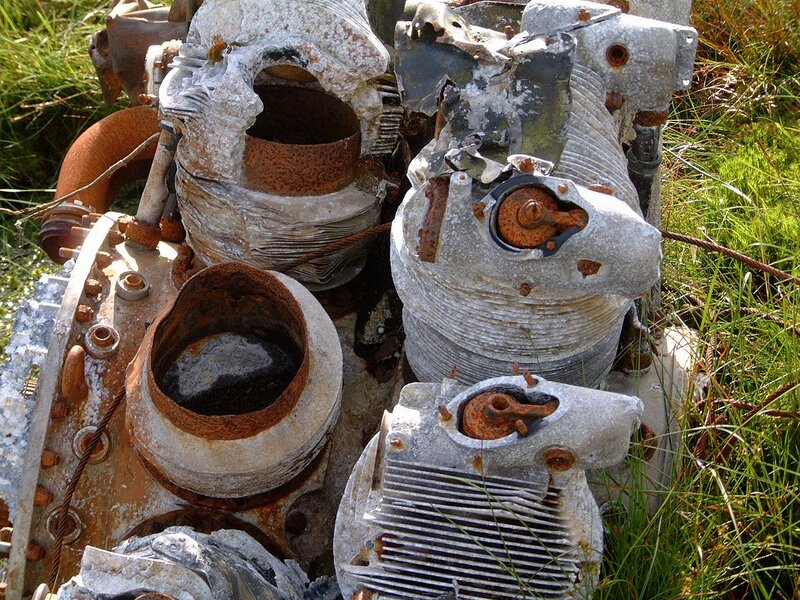 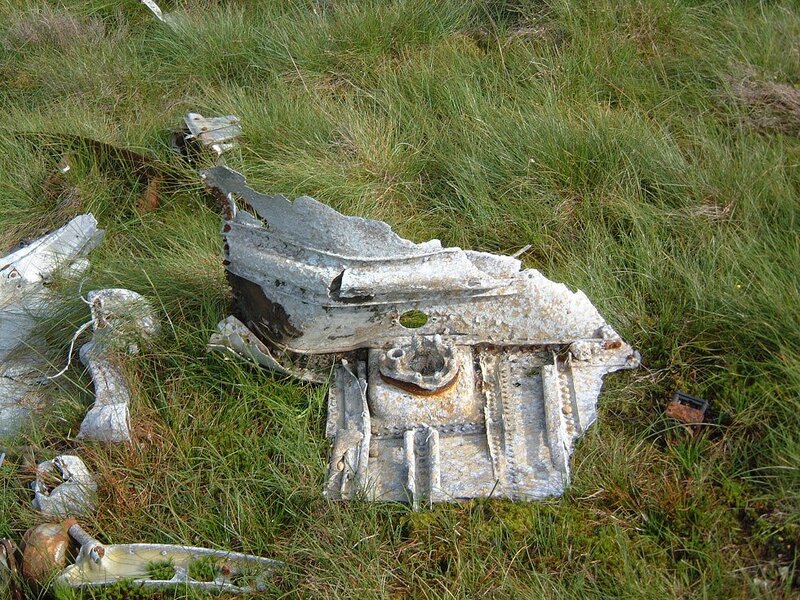 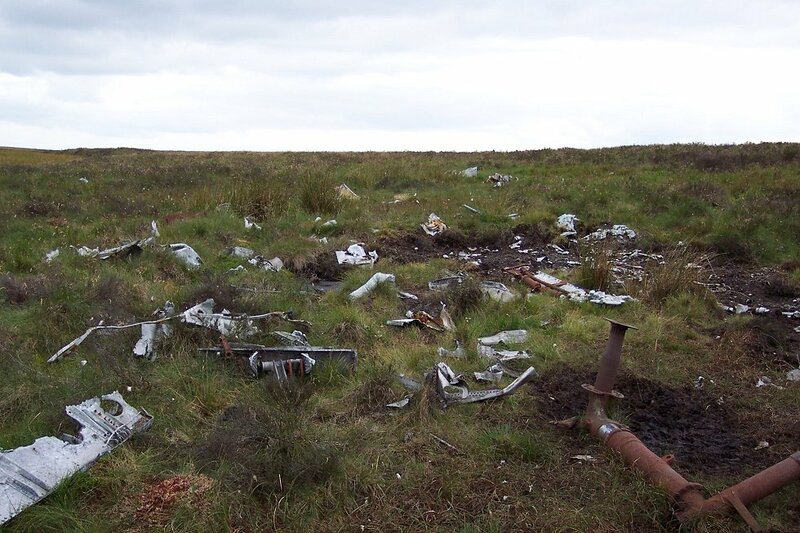 Much of the wreckage over the last 50 years plus, has probably been spirited away by souvenir hunters. 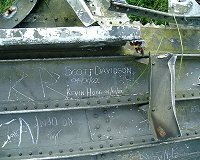 Let's hope that nothing else is removed from the site, and it remains as a memorial to those who lost their lives way back in 1956.